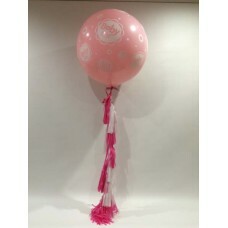 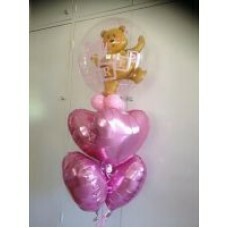 A helium jumbo 3 foot Baby Girl printed balloon, decorated with a handmade ..
A helium bouquet containing 2 pearl white, 2 baby girl printed balloons and..
An air filled pedestal balloon bouquet topped with a large shaped pink..
A helium bouquet containing 2 lavender foil hearts, topped with a large sha..
A helium bouquet containing 3 pink latex balloons and 3 pink confetti ballo..
A helium double bubble pink Teddy inside a bubble balloon, attached to a fo.. 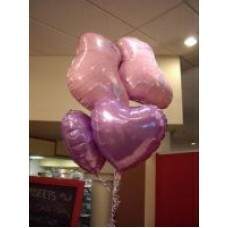 Pass the envelope to Balloon Brilliance and leave the rest to us. 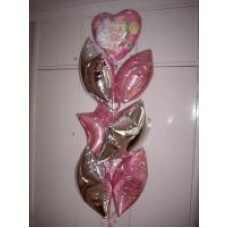 We ..
A helium bouquet containing 3 pink foil stars and 3 silver foil stars, topp..
A helium bouquet containing 4 pink foil hearts, topped with a double bubble..
A helium bouquet containing 6 pink foil hearts, topped with a teddy shaped ..
An air filled balloon column with a small pink teddy bear soft toy att..
A helium double bubble Pink Teddy inside the bubble balloon, decorated with..
An air filled pedestal balloon bouquet topped with a large round Welcome Ba..
A helium bouquet containing 2 magenta foil hearts and 2 silver foil heart b..
A Baby Girl deco bubble balloon, decorated with a handmade garland is attac..